Brothers and sisters, one thing that we can all agree on, regardless of denominational affiliation is that sin is rampant. I say this, not because I am looking at the world from my righteous seat, but because by the mercy of God, as I write these words I am looking at my wretched heart. So if there is some judging to do by me, let it be of my own corruptness, and when it comes to the world I should be concerned with sharing the love of Christ by action and as St. Francis of Assisi said ... See More "when necessary use words". So this whole mentality of pointing fingers at the world in contempt needs to stop; this clenching of the fist against those who we consider grave sinners needs to stop; this pushing those who we do not consider to be worthy away must stop. Encouraging others to follow Christ can be far more effective than telling them that they are going to hell. Not that we should not preach the full Gospel, but that the Good News should be gift wrapped with acts of love, compassion, mercy, tolerance, forgiveness and generosity. If I want to show the world that they should not sin then let me demonstrate it by my own pure living and not by my words, other than that, I should allow the Holy Spirit be the one pointing out sin. Think about this for a moment: Did you fall in love with Jesus because He pointed out to you all the things that are wrong with you on a daily basis? Or did you fall in love with Jesus because He loved you first in spite of the fact that there was plenty that He could have pointed out was wrong with your life? Was it not the kindness of the Sacred Heart of Jesus that attracted you to Him? Was it not His love that knocked down the walls of perdition from your heart? So then, if we are to be truly thankful to Christ Jesus for His forgiveness, let there be love towards others around us. If we are to truly worship and glorify our Lord, let there be love from us to all, even our enemies. I hate to say it brothers and sisters, but talk is cheap. Let’s stop talking and let’s start loving. 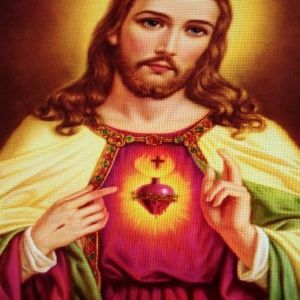 Sacred Heart of Jesus, we do not know how to love! Please help us to love as You love us. Amen.